Product code: P644 Categories: Sold Items, Sold Omega Watches. 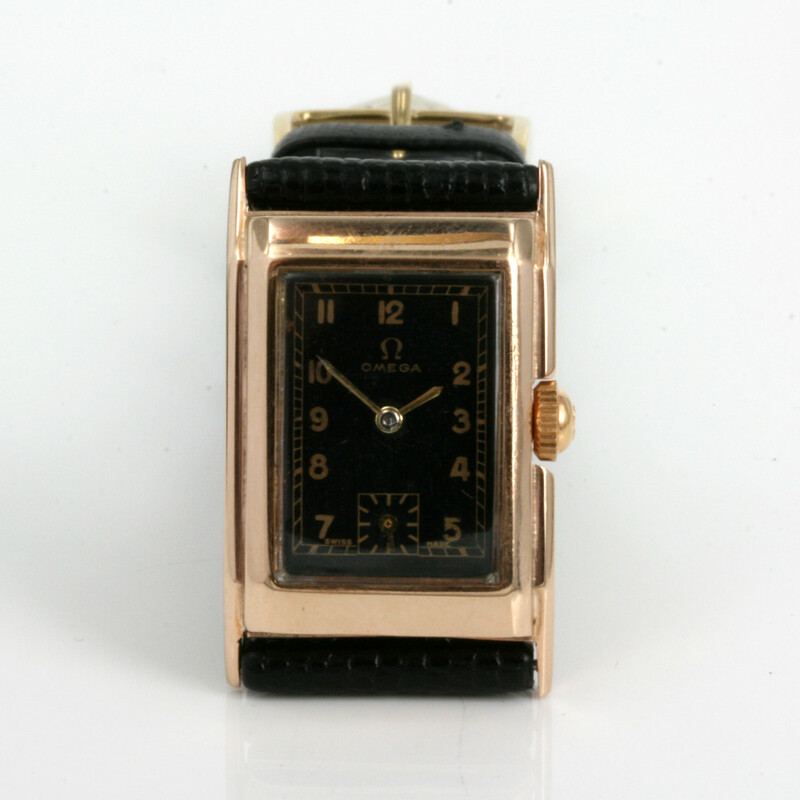 This is a very attractive early Omega watch dating as far back as 1926 and still going strong after all of these years. Made in a 9ct rose gold case with fancy stepped sides, the case measures 36mm from end to end by 22.6mm plus the Omega crown and sits so nicely on the wrist. 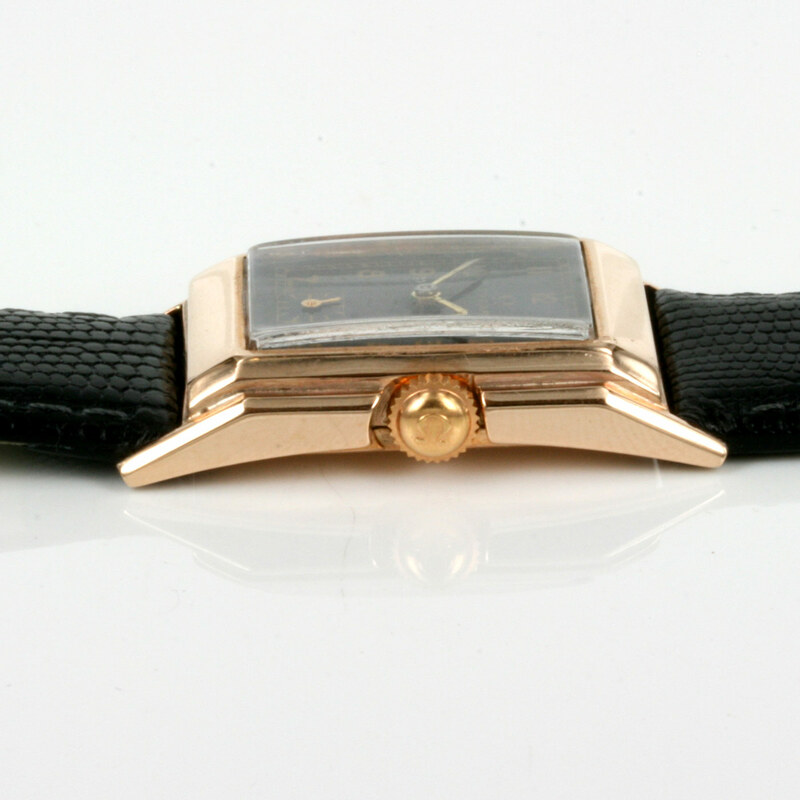 Rose gold watch cases always look good on the wrist thanks to the lovely warm colour that it has and this vintage Omega looks even better with its black dial with gold coloured numbers and sub-seconds. Inside this Omega is powered by a 17 jewelled manual wind Omega calibre T17 that has been fully serviced and runs great and comes with our 1 year warranty. The Omega T17 movement is a tonneau shaped movement with the 17 denoting the fact that it is 17mm wide. This movement also had the largest power reserve made by Omega with an incredible 60 hour power reserve and remained the longest power reserve movement made by Omega up until 2006. This is a great looking black dial Omega perfect for any vintage watch collector out there.